> > The comment says: "Silvermont has 2 out-of-order IEC, 2 in-order FEC and 1 in-order MEC." > Coding anything fp intensive with Silvermont in mind sounds like a challenging* task. Why anybody would ever care about FP performance is beyond me. Just look at history. FP has never ever mattered commercially. Ever. Intel laughed all the way to the bank in the old i387 days when the RISC camp was beating it silly. 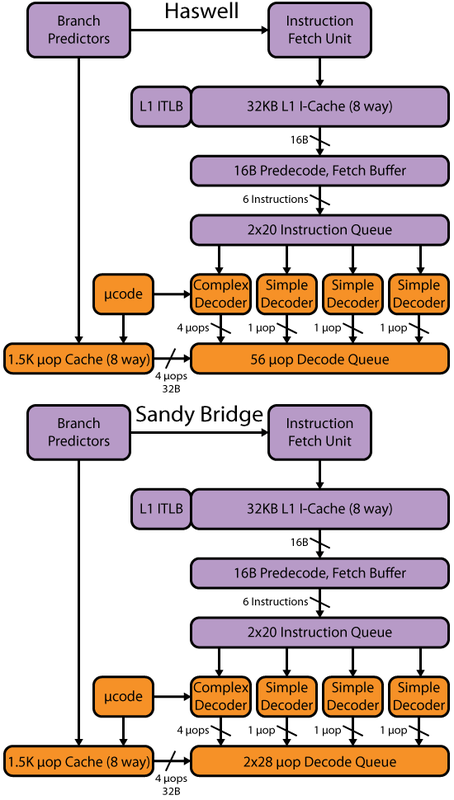 Intel beat them where it mattered: on random integer code. Nobody ever complained about the FP performance, although the RISC people were beating their chests purple about their lead. Fast-forward ten years, and the FP laughingstock was ARM, with its crazy variations on FPU's, and most chips sold not having one at all. Again, nobody actually cared, except the different variations just annoying people endlessly (and often caused people to use software FP - or at least library calls - even when there was hardware), and ARM sold like hotcakes. The only market use for FP is for graphics, and only a tiny amount of that gets done on the CPU, mainly setting things up for the GPU. Yeah, yeah, games do FP on the CPU too, but it's dwarfed by the non-FP parts they do. I realize this forum has people who do fluid dynamics and stuff like that, but sorry guys, you're not a market for anybody, you're an afterthought. Even now, FP seems to matter only for benchmarks, not for any actual real load that sells machines. And even there, if the benchmark is actually worth anything at all, it's not about the actual FP capabilities most of the time, but about the memory subsystem. AVX? Who could possibly care in the kind of space Atom is designed for? Really?